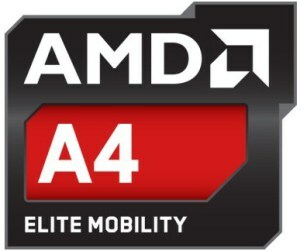 The AMD A4-9120C is an entry-level chip from the Stoney-Ridge APU series for Chromebooks and entry level laptops (7th APU generation from 2016), which was announced early 2019. It is based on the similar named A4-9120 from 2016 but with a reduced TDP (6 versus 15 Watt) and reduced clock speeds of 1.6 - 2.4 GHz (compared to 2.2 - 2.5 GHz). Both CPUs integrate two CPU cores (one Excavator module with 2 integer and on FP unit). It also includes a Radeon R4 GPU with 192 shaders at 600 MHz, as well as a single-channel DDR4-2133 memory controller, H.265 video engine and chipset with all I/O ports. Because of the significantly lower clock speed, the A4-9120C should be noticeably slower than the old A4-9120. AMD compares the A4-9120C with the Celeron N3350 in ChromeOS and sees a significant performance advantage for the A4. The efficiency however should be clearly worse as the A4-9120C is still manufactured in 28nm. AMD specifies the TDP of the A4-9120C with 6 Watts which should enable thin and light Chromebooks (even fanless).